Sherman Falls near Hamilton, Ontario, Canada. Nikon D7100/Tokina 11-16mm, f/22, ISO 100, EV 0, 16mm (24mm DX), tripod, HDR Image. Just returned from a quick trip up to Hamilton, Ontario, Canada where I meet up with a local photographer I connected with on Google+. I was toured around the city known as the City of Waterfalls. We visited eleven of the thirty-four waterfalls in and around the city of Hamilton. I will post more about this adventure later in the week. For now, enjoy this HDR image from a bracketed set of photos of Sherman Falls. 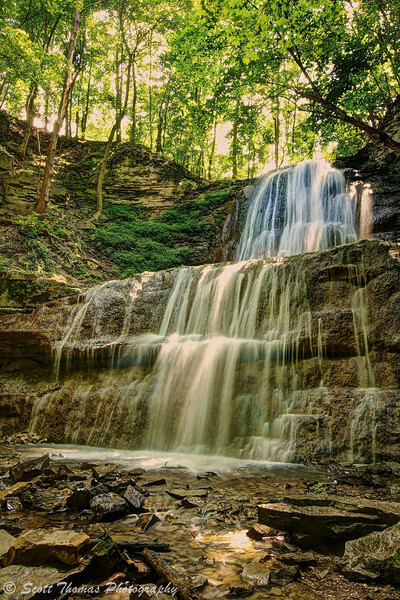 It is a 17 meter (56 foot) tall terraced ribbon waterfall feed by Ancaster Creek. This entry was posted in Nature, Weekly View and tagged ancaster creek, canada, city, flow, hamilton, hdr, high dynamic range, nikon D7100, ontario, photomatix, rocks, sherman falls, tokina 11-16mm, tripod, ultra wide angle, uwa, water, waterfall. Bookmark the permalink. The waterfalls are not far from each other. We went all over the greater Hamilton area to see them. Took most of a day. The heights ranged from 3m to a few over 20m. No kidding? 34 waterfalls? I’ve been living in the area for a decade and didn’t know that. I guess I know where I’ll be going next weekend. Thanks for the tip! Er, did your friend take you to any good Chinese or Indian restaurants while you were there by any chance? About half of the ones we visited had little to no water flow. I will have another post this week which will give you your best bets. Late summer is a tough time for waterfalls unless a good rain or storms occurs. Spring is the best time with snow melt and rain showers feeding the streams, creeks and rivers. Oh, and no she did not mention nor did we ask about good Chinese or Indian restaurants. However, we saw lots of them so there must be some good ones! Finding a good Chinese or Indian restaurant is a little like finding a mate… half the fun is sampling and ruling out the bad ones! Beautiful work Scott, and Madison Indiana where I live has about that many as well spread across the county !! Considering where Hamilton is, I was surprised to learn of the waterfalls. I am used to the hard granite of the Canadian Shield which does not erode to create waterfall gorges. I need to look into the geology which looked like the glens and gorges here in New York. Wow…just awesome! Hamilton must be one beautiful city. Glad you and Merrie were able to visit and enjoy a weekend away. Miss you and love you! Oh, we got quite a tour. We’ll be back. See you at the Fair! You should go to Oregon & check out the great waterfalls along the Columbia River…….they are majestic & breathtaking! Don,t forget your cameras. Toots in WI.